The Vancouver Condo Buzz » GRAND OPENING! 900 Hastings Vancouver Condos for Sale! 283 View Residences from $249,900 at Wall Centre 900 Hastings Wall Financial. Proudly Strathcona! GRAND OPENING! 900 Hastings Vancouver Condos for Sale! 283 View Residences from $249,900 at Wall Centre 900 Hastings Wall Financial. Proudly Strathcona! Coming in late Fall 2013, the Wall Centre 900 Hastings Vancouver condo tower will feature affordable downtown living. Proudly located in Vancouver real estate’s historic Strathcona neighbourhood, the 900 Hastings by Wall Centre will be a 15 storey high-rise tower with playful architecture and modernist/simplistic design concepts. Brought to you by Wall Financial developers, the Wall Centre 900 Hastings Vancouver Strathcona condos for sale will feature a total of 283 homes for sale with an expected starting price point around $249,900. Proudly Strathcona. Affordable living. Great up and coming neighbourhood. What more would you ask from this centrally located development? Affordable home ownership in Historic Strathcona Vancouver > Designed to meet LEED Silver Standards by Vancouver’s own gBL Architects with innovative, quality construction, the 900 Hastings Vancouver condo project is by Wall Centre. Two deluxe colour schemes by award winning BYU Design, one in light wood tones and the other in glossy whites with charcoal accents allow presale homebuyers the ability to customize their own home. The harbour container design of the building’s façade with its extensive glazing, colourful metal panels, exterior balconies and amenities was inspired by the Strathcona industrial past and present. In addition, the expansive floor to ceiling windows let in an abundance of natural light and give you incredible views in all directions. The Wall Centre 900 Hastings Vancouver condo tower in Strathcona also present efficient floor plans that are also functional. Textured laminate wood floors and optimal concrete inspired tiled flooring throughout enhances the industrial chic design look and feel of the homes. There is a convenient combo USB and electric outlet plugs in the kitchen for added convenience and there is eco friendly landscaping and green roof that reduces the buildings carbon footprint. The Wall Centre 900 Hastings Condos in Vancouver Strathcona real estate district will have meeting rooms and fully equipped fitness centre, multiple outdoor landscaped spaces, patio gas fire bowl, secured underground parking, restricted floor access, charging stations for electric vehicles, and an ideal location just steps from local restaurants, cafes, bars, entertainment and shipping. 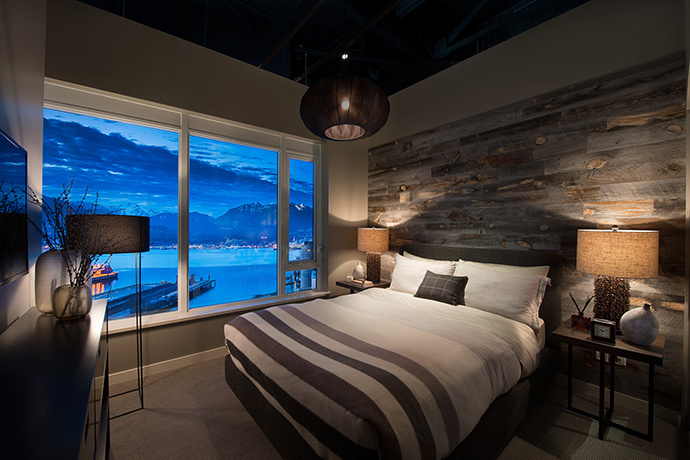 The 900 Hastings Vancouver Wall Centre condos will also give you stunning views of the water and North Shore mountains in addition to the downtown skyline. It’s also within close walking distance to Commercial Drive, Gastown, Downtown and Chinatown. The spa like bathrooms will include quartz composite stone counters, deluxe custom vanity with extra storage drawers and contemporary soaker tub with sleek and lasting finishes. 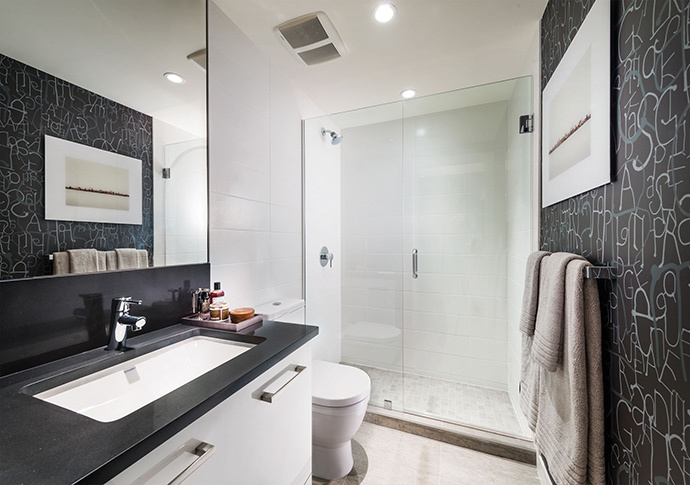 Also, the 900 Hastings Strathcona condos for sale will include a Philippe Starck dual flush toilet by Duravit, stunning frameless glass shower, ultra modern Grohe water efficient shower head and faucets and Grohe polished chrome faucets with WaterCare technology. The sleek kitchens at Wall Centre 900 Hastings condos in Vancouver include convenient open style shelves, under cabinet lighting, designer Grohe faucet with pull out feature, custom integrated front paneled Porter & Charles dishwasher and sleek stainless steel Porter & Charles gas cook top and oven with stainless steel backsplash. 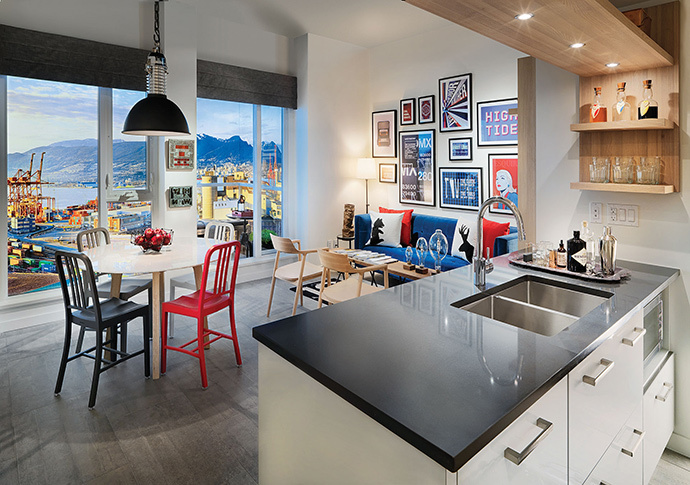 Other incredible features at 900 Hastings Vancouver Strathcona condos include luxurious, durable quartz composite stone counters and backsplash, custom integrated front paneled Liebherr Energy Star fridge and freezer. 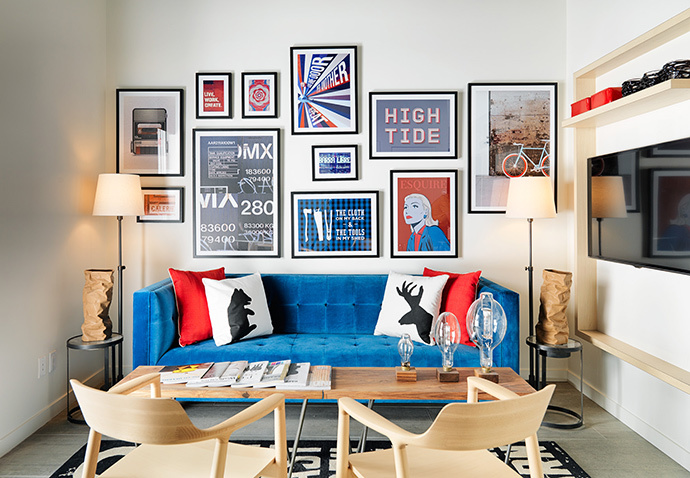 “Uniquely Vancouver” > Buy a Brand New Strathcona Condo This Fall! Wall Centre 900 Hastings is starting previews in the Fall of 2013 and this is your chance to purchase a truly affordable new home in the heart of the historic downtown Vancouver market. Overlooking the North Shore Mountains, Burrard Inlet waterfront, downtown and Port Metro, the new Wall Centre 900 Hastings condo towers will offer not only sweeping views but also a transit oriented community that is very close to the city core and many neighbourhood cafes, eclectic stores, studios and cultural attractions. Both character and story make this location uniquely Vancouver. As one of the oldest residential neighbourhoods in Vancouver Downtown, Strathcona is on the verge of becoming the most attractive and last up and coming community where home buyers can purchase a cheap apartment. With history dating back to 1865, the Strathcona Vancouver 900 Hastings Wall Centre condos are within walking distance to developing Chinatown, boutique Gastown and even trendy Commercial Drive District, all of which have seen enormous transformation in the past decade. Strathcona Vancouver strives to keep its historic presence whilst gentrifying to become a liveable, green and sustainable community. The Wall Centre 900 Hastings Vancouver condos will be built to LEED Silver standards and the buildings are designed by gBL Architects, an award winning firm that is a member of the Canada Green Building Council. The bold and beautiful colours of the exterior façade at 900 Hastings Vancouver Wall Centre make it truly unique and blend seamlessly into the industrial past and present at Port Metro Vancouver. The architecture is designed to reflect containers that are stacked on top of one another. Bands of colour and large windows capture the essence and vitality of life in Strathcona Vancouver. In addition to there a charging station for electrical cars plus a green roof, making this project one of the greenest in the city! Striking and modern interior finishes will be standard in each and every home here. The interior finishes are selected by BYU Design and will be unique to new developments in the area. In addition, many of the Wall Centre 900 Hastings Vancouver condos will have outdoor living spaces (plus common outdoor patios and urban agricultural plots). The kitchens are open concept and will have open style shelves, airy living spaces and top of the line stainless steel appliances. Gas cooktops and ovens are included as standard as are beautiful and low maintenance laminate wood floors and concrete inspired floor tiles. There’s also NEST Learning Thermostats available for homes. 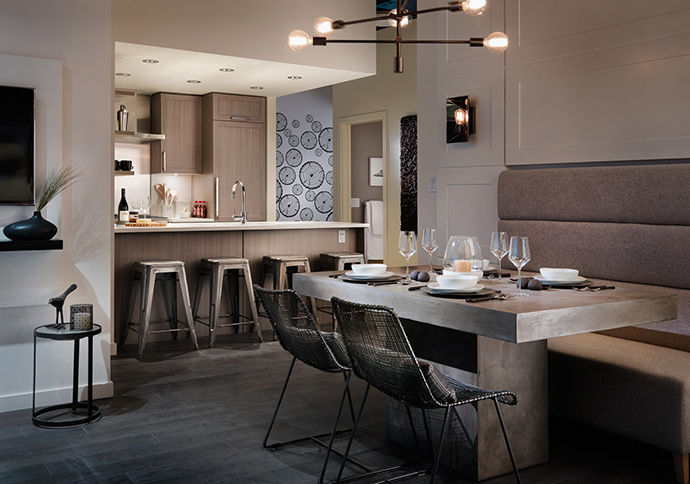 There are 2 distinct design colour palettes available at Wall Centre 900 Hastings Vancouver condos: one with light wood tones and neutral finishes and the other with glossy whites and darker accents. Both are amazing. Strathcona is central to everything. From the downtown core to Gastown/Crosstown and Chinatown, the Strathcona Vancouver 900 Hastings condo project will be ideally located for urbanites. Bike and bus routes are just blocks away as is lots of dining, shopping and boutique stores. The Strathcona and Andy Livingstone Parks have basketball and tennis courts in addition to a soccer field and Trout Lake is also nearby with its off leash dog park areas. False Creek and Canada place are within reach and the Vancouver Public Library at 730 East Hastings Street is just next door, with a proposal to build a 12,000 square foot library with a YWCA facility. 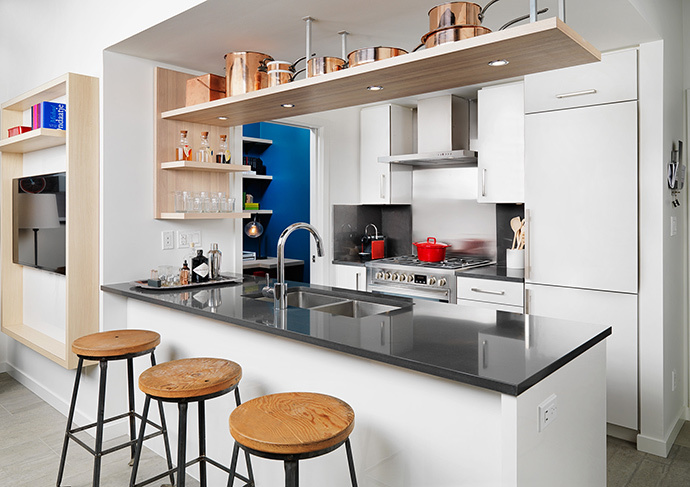 The Wall Centre 900 Hastings Vancouver condos are about convenience and character. Brought to you by the same team behind Wall Centre Central Park, Shannon Wall Centre Kerrisdale, 2300 Kingsway, Capitol Residences, Yaletown Park, and of course, Wall Centre Downtown. Wall Centre 900 Hastings Vancouver condos is located in fabulous Strathcona with immediate access to the downtown core, Gastown, and Chinatown. This is affordable home ownership in Vancouver at its finest. Homes will feature contemporary interiors with elegance and efficient design in mind. 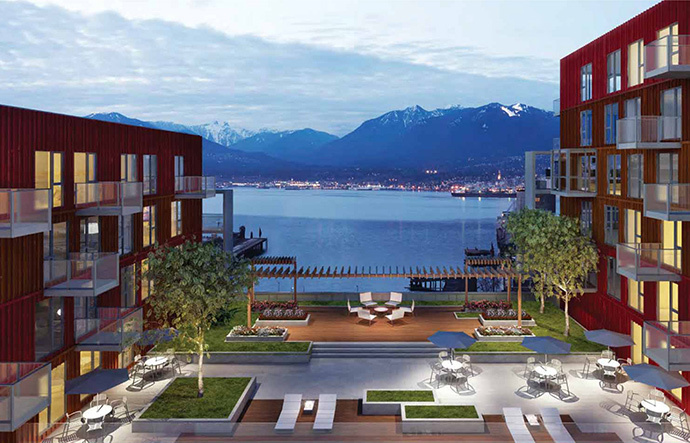 Stunning panoramic views of Burrard Inlet, the North Shore mountains and beyond are going to amaze you. Our brochures and floorplans are just being printed but you can have a sneak peek of it here. 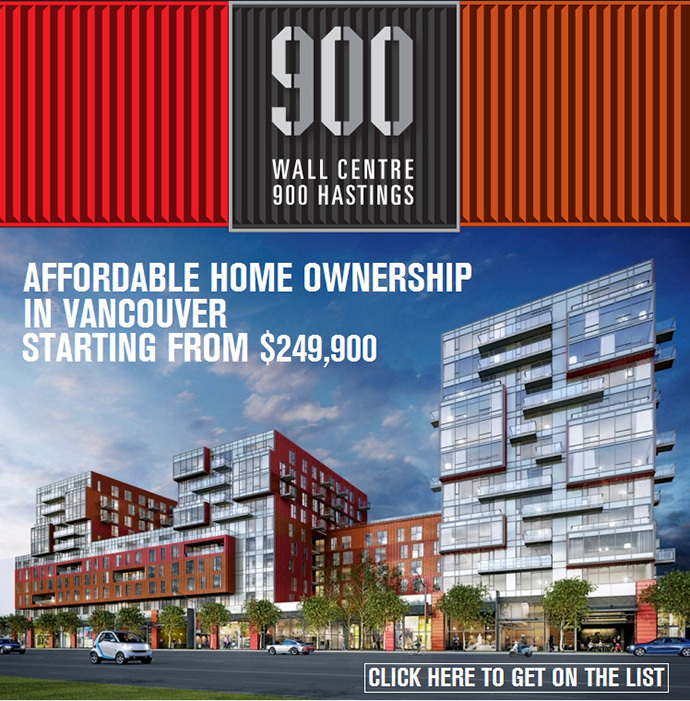 If you are interested in buying a new home in Vancouver in the vibrant community of Strathcona, you must check out the Wall Centre 900 Hastings Vancouver condo project. The Presentation Centre is located at 1320 Richards Street (At Drake) and will feature 2 designer display suites. Previews begin on Saturday, September 21, 2013, with sales starting in late October. The 900 Hastings Vancouver condo presentation centre will be open after September 21 from 12-5PM daily, except Fridays, or by appointment. Don’t miss out on this truly unique opportunity, register now for early access.